…or Do I Have to Stay on Thyroid Medication for My Whole Life? It wasn’t long ago that someone referred a patient to me who had been on thyroid medication for several years. 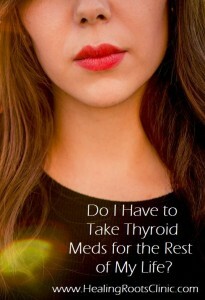 The most important thing she wanted to know from me was whether or not she would ever be able to stop taking the medication and have a normal functioning thyroid. She had weaned herself off of the medication more than once and each time she would slowly re-experience symptoms of thyroid disease, which was hypothyroidism in her case. As we talked, she was pretty convinced that the issue was out of her control. After all, she had tried meditation and regular intake of coconut oil for months before one attempt to discontinue the medication with no results, and her MD had told her it was a life-long prescription. We’ll come back to her story in just a minute. We’ve reviewed the the basics of the thyroid and thyroid disease, and we’ve discovered why thyroid dysfunction is under-diagnosed. Now we’ll look at how thyroid dysfunction is by-and-large over-medicated. When TSH (thyroid stimulating hormone) is too high according to standard lab ranges, indicating that the thyroid is under-functioning, the answer from conventional medicine is to use a pharmaceutical replacement. This, I believe, is over-medicating the majority of the time. Patients are led to believe that their thyroid is actually the issue (most often, it is not). Many are also told that they must be on thyroid supplementation for life. I find this to be untrue, and hope you’ll agree with me after you understand more about the thyroid. Why do some many people have thyroid issues? The American Thyroid Association (ATA) states that “the cause of thyroid problems are largely unknown.” This attitude is reflected in the conventional medical approach to treating thyroid conditions. The most common treatment for Hashimoto’s (autoimmune hypothyroidism) and non-autoimmune hypothyroidism is simply replacing thyroid hormones with a pill (either a pharmaceutical equivalent or sometimes a naturally derived substitute). The most common treatments for Grave’s disease (autoimmune hyperthyroid) is surgical removal of the thyroid gland, radioactive iodine to destroy the thyroid tissue, or, in some cases, beta-blockers to slow the heart rate and anti-thyroid medications. From my mindset as a Naturopathic Doctor, this is simply treating a symptom and not the underlying problem. I believe it’s better to truly address the cause of the thyroid symptoms. Dr. Mark Hyman, an MD who practices functional medicine, often uses the analogy of a fire and its smoke as the underlying problem and the smoke detector beeping as the resulting symptoms in our body. If there is an underlying problem in the body, then you may experience symptoms of thyroid imbalance. Most often, your thyroid is just the smoke detector, not the fire itself. When one simply takes a replacement thyroid hormone or destroys the thyroid, he or she is very likely ignoring the underlying reason that the thyroid is not functioning properly. This is likened to taking the batteries out of the smoke detector; there’s still a problem in the body and therefore there’s still a fire burning. The body will continue to fall further out-of-balance, sometimes subtly and sometimes in very big ways. 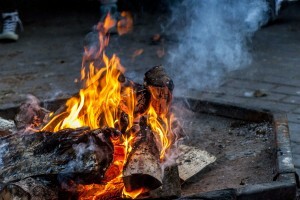 Admittedly, it isn’t always easy or straightforward to discover the true root cause of a person’s thyroid symptoms, or where and why a fire is burning. Every person is unique and so are the myriad of reasons why we develop diseases, including those involving the thyroid. Though in every case, one thing can be said: the body is telling us clearly that something isn’t right, something is out-of-balance… please put out the fire! The immune system is mounting an inappropriate response against the thyroid, mistaking it for a foreign invader like a virus, parasite, or bacteria. This is an autoimmune response causing either hypo- (Hashimoto’s) or hyper- (Grave’s) thyroid symptoms because the gland is being either over-stimulated or destroyed. All of the above reasons, please remember, can be scenarios where screening labs for thyroid function, typically measurements of TSH, will look normal. In all of these scenarios, nothing is wrong with the thyroid itself. When the thyroid itself is actually under-functioning, the term non-autoimmune hypothyroidism is used which is explained further in the next blog post. We now have a long list of things that can contribute to the development of thyroid disease. Let’s pause for a moment and look at the fact that nowhere do I mention a deficiency of Levothryoxine or another pharmaceutical used as thyroid replacement as the cause for thyroid problems. I don’t even mention a lack of Nature-Throid or other naturally derived replacements. This is because thyroid replacement is not the problem that needs to be fixed; it’s by and large other factors (stress, diet, heavy metals, and other things) that need to be addressed in order to alleviate symptoms associated with thyroid disease. The idea that thyroid medication doesn’t adequately address thyroid disease is an enlightening idea for many. To return to the woman at the beginning who came to see me, if stress and a racing mind had been at the root for her (and I emphasize this because everyone has a different constellation of issues that contribute to the development of thyroid disease), which was impacting signaling between her pituitary and thyroid or causing her thyroid to become burned-out compensating for adrenal fatigue, then, yes, choosing to do meditation might have healed her thyroid. However, from the above list you can see that there are many reasons for thyroid dysfunction she hadn’t explored (a poor diet, a chronic infection, excess estrogen, an autoimmune issue, etc). Even if stress was the original underlying cause, by the time she was diagnosed by her MD and then by the time she was in my office, her thyroid, pituitary, and adrenals were all likely in need of nutritional and herbal support to recover before she weaned off the pharmaceutical again. The majority of the time, there are many factors from this list of contributors to thyroid disease that need to be addressed. Sometimes treating low thyroid function is as simple as starting a sensible exercise regime and eating better. Other times it can take some detective work and the help of an expert to navigate and guide you through all of the many possibilities in order to restore thyroid function. In the vast majority of cases, it is possible to address thyroid health without pharmaceuticals. That being said, there can be times when medications are a helpful temporary tool. For instance, if symptoms such as fatigue and brain fog are very severe, then immediate thyroid replacement is needed in order to feel better and successfully tackle a treatment plan. Autoimmune cases can also sometimes benefit with replacement to act as a decoy while the underlying causes are addressed. It is also important to know that thyroid medication interrupts communication between the various components of your endocrine system, particularly the pituitary and thyroid. If you have been on thyroid medication for a long time, the thyroid usually needs a lot more support to help it restore function and that’s not always the best road for everyone. However, there is so much benefit from treating the underlying cause rather than simply medicating! When you look at all the list of underlying causes, I am sure you can agree that things like stress, gut health, nutrition, toxins, etc are impacting other areas of the body as well as the thyroid. That is why it is important to treat thyroid function as a low-grade fire in your body causing the smoke detector to beep. When it’s beeping and you have symptoms, you have an opportunity to change something that will make your health today and tomorrow better. Are you wondering how you can address some of the causes of dysfunction? First, make sure you understand the difference between non-autoimmune hypothyroidism and autoimmune thyroid conditions (Hashimoto’s and Graves’) because the basis of the treatment and suggestions will be different. Second, look into specific nutrition for your thyroid and learn how to detox your environment to protect your thyroid. Ive been diagnosed with early hypothyroidism based on TSH of 4.5, before it was 4.12; having read your very interesting article I can see that perhaps, there is a lot more to it. I’ve been through a year or so of stress, have had gut issues which are being addressed but I really feel that the guidance from the GP or local Doctor isn’t enough. I feel as you point out that there have been symptoms for a while not picked up on. My white cells are lower that normal. I’m going to see a Doctor who is also an Ayurvedic Doctor to get alternative view and the nutritionist I ‘m going to suggested that I get more bloods done to clarify either autoimmune or immune hypothyroidism. Feel a bit helpless in it all, where do I turn? I second your nutritionists suggestion that you have antibodies tested to see if the the issue is autoimmune hypothyroid (Hashimoto’s) or non-autoimmune hypothyroid. Your conventional doctor may say it doesn’t matter but if you are interested in getting at the root cause, it will matter. One is an immune issue and the other is more of a thyroid issues (although both have roots related to other causes and symptoms). This is a good place to start! Do make sure that you read my other blogs on hypothyroidism so you can get an over view of the big picture and what needs to be looked at. It was a nice post. Thanks for posting so much informative content. This entry was posted in Natural Medicine, Thyroid and tagged Graves Disease Denver Colorado, Hashimotos Denver Colorado, Naturopath Thyroid Denver Colorado, Thyroid Disease Denver Colorado. Bookmark the permalink.